A loving tribute to a bygone era of filmmaking, The Artist makes everything old new again. The black and white, silent story of a career lost and a love gained strips down the art of the movies to its essence, and demonstrates that when the core is polished to a stunning shine, not much else needs to matter. It's the late 1920s in Hollywood, and George Valentin (Jean Dujardin) is enjoying the adulation that comes with being the most popular movie star of the silent era. Charismatic, talented, living in a mansion and with the world at his feet, George can ignore his brooding wife Doris (Penelope Ann Miller), and he allows his eyes and heart to stray towards young adoring fan and aspiring extra Peppy Miller (Berenice Bejo). George helps Peppy get her start in the movies but soon the industry is thrown into turmoil: sound has arrived, and studio boss Al Zimmer (John Goodman) redirects all resources towards the new technology, and starts the search for fresh new stars whose voices will be heard. George refuses to adapt, and stubbornly persists with silent movies, even self-financing a grand silent epic. But audiences are no longer interested in mute movies, the film is an expensive flop, George's career is left in ruins, and the Great Depression further bites into his fortune. Grace leaves him, and only his faithful canine co-star and his butler / chauffeur (James Cromwell) remain by his side. Meanwhile, Peppy emerges as the sweetheart star of the exciting new era of talking movies. With their careers in opposite trajectories, it's Peppy's turn to extend a helping hand to George, but a stubborn and proud man does not easily accept charity from others. 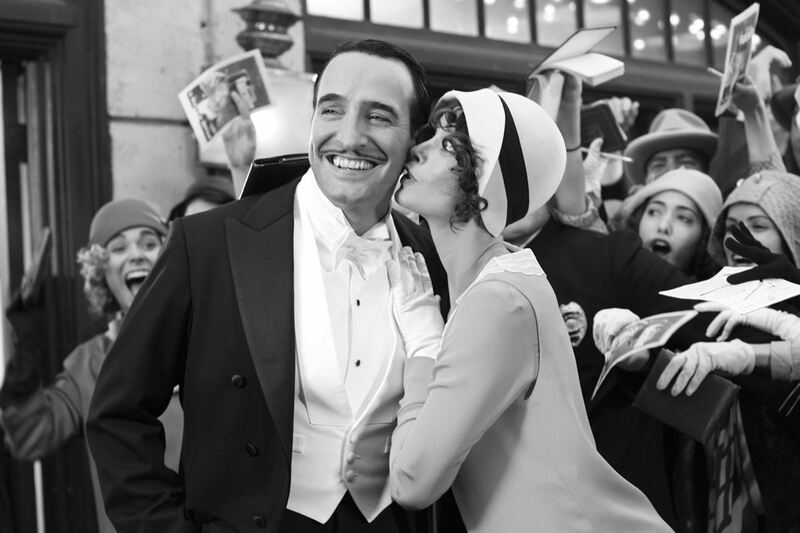 French director and writer Michel Hazanavicius tenderly eulogizes the silent era, The Artist teasing drama and love out of joyous acting, cinematography, music, and clever humour. 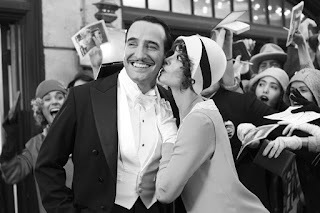 Dujardin and Bejo (Mrs. Hazanavicius) give expansively expressive performance that recall all that was good when acting had to convey both actions and words, Dujardin's megawatt smile illuminating the screen and Bejo's more understated elegance embodying women's emerging glamour in the 1920s. Cinematographer Guillaume Schiffman plays with shadows, mirrors, and clever angles to create a masterpiece of blacks and whites, the screen sharply alive at all times with the energy of artistic composition. The Artist does not pursue profound messages. The story of George and Peppy is a simple slice of life recounted with heart-felt affection, and the reinvented storytelling method is a large part of the exquisite message. The remarkable achievement of The Artist is that the need for spoken dialogue and colour are quickly forgotten. When a story can be told with this much style, artistry and elegance, additional aural and visual stimulation are just so much clutter. George Valentin's attitude is validated in the movie that chronicles his downfall.